White Opaque Polyester grade is a Bi-axially Oriented Polyester film characterized by high opacity, whiteness and low transparency. Its high mechanical strength and dimensional stability makes this film suitable for varied printing applications especially in label and graphics industry. This film is suitable for all usual printing processes like offset, flexographic or gravure printing. This film has glossy satin finish and pre-treatment (42 dyne) on both surfaces to promote adhesion to most industrial inks and coatings. This film is available in various versions viz. corona treated, chemical coated and/or with metallization. It is available in the thickness range of 23 to 50 micron. 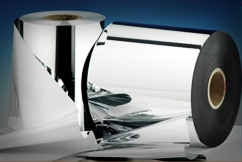 In addition to the label and graphics industry, the white opaque film also finds usage in lidding applications. Another very special and unique usage of this film is vide its lamination with grey paperboard for secondary packaging (cartons etc). The usage of this white film eradicates the use of expensive white paperboard, and increases the colour consistency of the packaging solution. This film conforms to EC 10/2011 directives, REACH specifications and US FDA regulations for food contact application. High opacity and good optical properties. Excellent thermal and mechanical properties. Lidding for dairy products, water, juices etc. High quality alternative to paper, e. g. product catalogue etc. Prepaid cards and multiple usages tickets.